Card-game-based video games have grown more popular in the recent years. 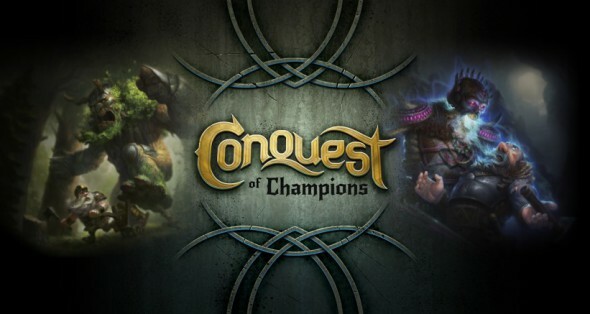 One of those games is Conquest of Champions, a game that blends together the elements of a strategy game (like Final Fantasy Tactics) and the elements of a card-game similar to Magic the Gathering. 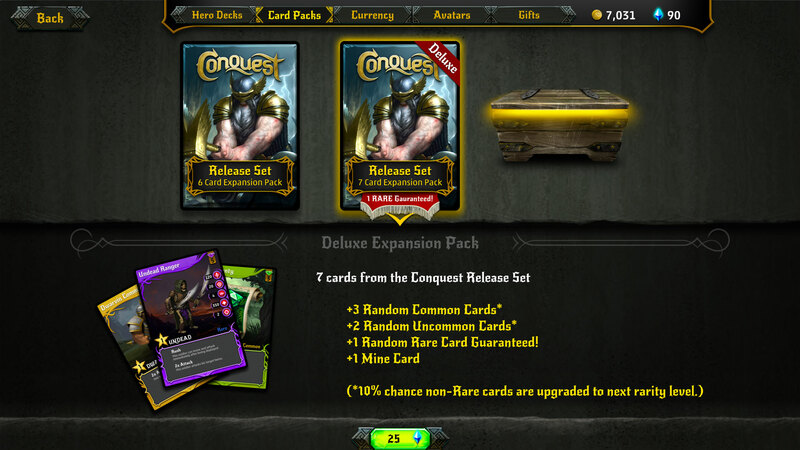 Make your own deck, play with it and level up your favorite cards and make your way to the top in Conquest of Champions! At the beginning of the game you will be given a tutorial that shows you how the game functions and what you need to know in order to play. You’ll be given a chose between three different factions: you can either enter the Stonehold (home to the dwarves and constructs), Brianwood (divided between elves, beasts or treefolk) and Embercult (which involves demons and the undead). Available for all three of these factions will be two different heroes: you get the option between Gorin or Daggan for Stonehold, Declan and Krak for Brainwood and between Blight or Skorn for Embercult. Each of the factions have their own unique background maps that improve the atmosphere while playing. Each map are evenly big, so there isn’t much difference aside from the looks. The goal of the game is to fight against others players or the AI in matches. When you start a game you’ll be able to choose what deck you want to play. You’ll get one starter deck according to your chosen faction when you first start out. You can choose between two types of matches: first you have a quick match in which you compete against another player through live play, meaning that you’ll each take turns after the other completed their turn. The other type of match is an extended match, this means that you search for an opponent or friend and play against them but not through live play. This means that within a time limit of three days, each player has enough time to complete their turn without the opponent having the need to be glued against the computer. In other words, in an extended match each player has enough time to plan out their turn or you can play against a friend that doesn’t have much time to play online. In order to win a game you’ll have to destroy both the enemy hero and their 2 shrines by dealing them enough damage. Damage can be dealt by either having your hero attack them or by deploying your own soldiers in order to help you deal that damage. You fight on a large map divided in squares, where there are 2 shrines available on each side, a couple of mines that provide you with minerals that you’ll need in order to play your cards and spawn tiles where you’ll spawn your soldiers. Soldiers are spawn by using your soldier cards and by using those cards on either your starting spawn tiles or captured spawn tiles and will not be able to take an action during the turn they are deployed. At the beginning of each of your turns, your mineral mines will provide you with minerals depending on how many mines you have and whether they are upgraded or not. Aside from using your starting mines, you’ll also have the option of capturing mines. If you do, you’ll have even more recourses at the start of your turn, meaning that you’ll be able to use more cards each turn. Before capturing your opponent’s mines, you’ll need to destroy the mine first and then have a soldier or your hero construct a mine for you. If you have no cards left in your hand, you can spend 2 resources to draw a card (can only be done once per turn). If you wish to attack with your soldiers or your hero, you’ll need to have sufficient Action Points (AP for short). You’ll have a total of 10 AP to use each turn. 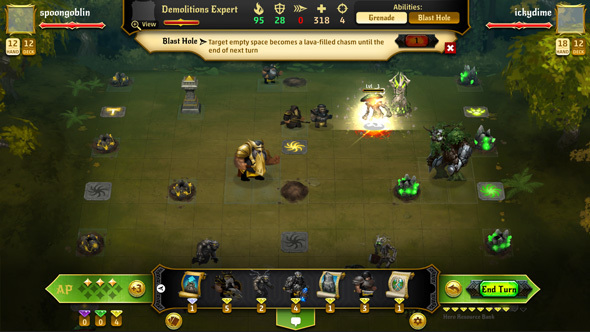 There are quite a lot of different cards available in the game: hero cards that will be deployed at the beginning of the match and serve as your leader and lifeline, totem cards that provide certain effects when they are present on the map, soldier cards that will help you deal damage or capturing mines, spells that give you advantage in a lot of ways (like destroying totems or drawing cards) and enchantments that give boosts to your soldiers. As preparation before each match, you have the option of editing your deck in a couple of ways. 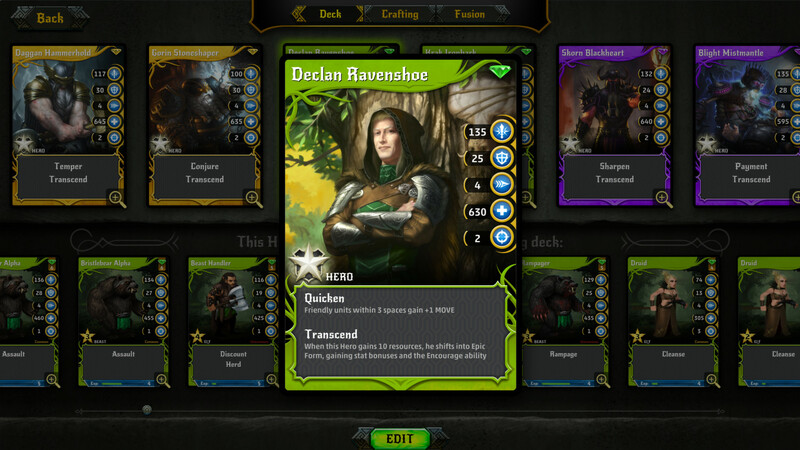 Firstly you can swap cards that you obtained while playing the game with cards in your deck, providing you with the option of creating your own personal and unique deck. You can also improve the cards you have by either fusion them with cards that you don’t need, which gives the boosted card a couple of Experience Points that will eventually level up your cards and improve their stats. Finally you can also craft yourself new and better cards by using a recipe of different combinations of cards. These are a little more tricky to pull off as you need to have the right cards, but they will definitely improve your deck by a lot. You can obtain new cards through either crafting them, obtaining them while battling opponents or by buying booster packs in the shop. You can buy packs by either using in-game coins that you earn by winning games, or by spending real money. So for those that do not like to pay for getting new cards and for those who wouldn’t mind doing it, you’ll have the option of doing both. The graphics are pretty simple and do their job fine. The music is also pretty good, except that it might get a little repetitive as it will almost always be the same tune that is being repeated. But they fit their environments so the theme of each map is certainly present. The only complain that I have with the game is that you’ll sometimes need to wait before your opponent ends their turn. It sometimes happens that you’ll be waiting until the time limit of your opponent has run out, resulting in a forfeit for them and a win for you. Overall, the game definitely has the chance that it will grow out to one of the most popular card game based online game to date. While simple, the graphics and sound fit the theme of your faction well and are enjoyable to see/listen to, although there really isn’t much variation. The gameplay is definitely fun and offers enough challenge for you to keep you coming back to this game.